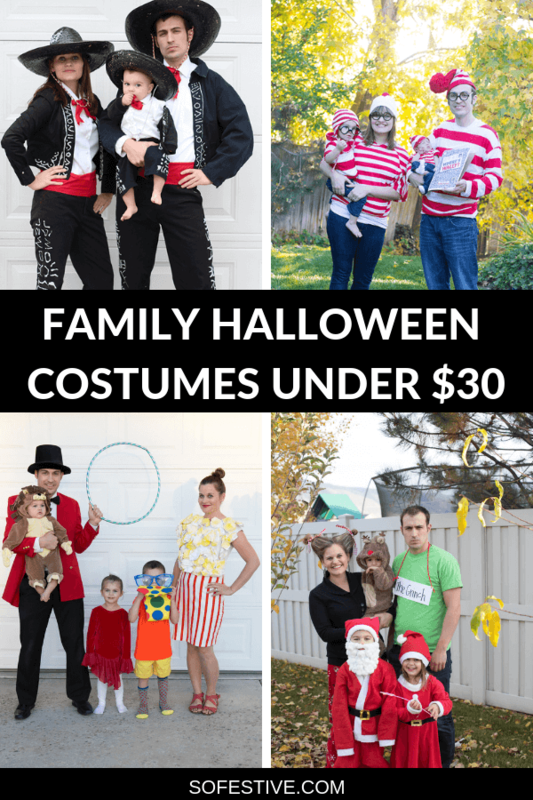 6 Awesome Family Halloween Costume Ideas For Under $30!! - So Festive! Need a family Halloween costume idea? 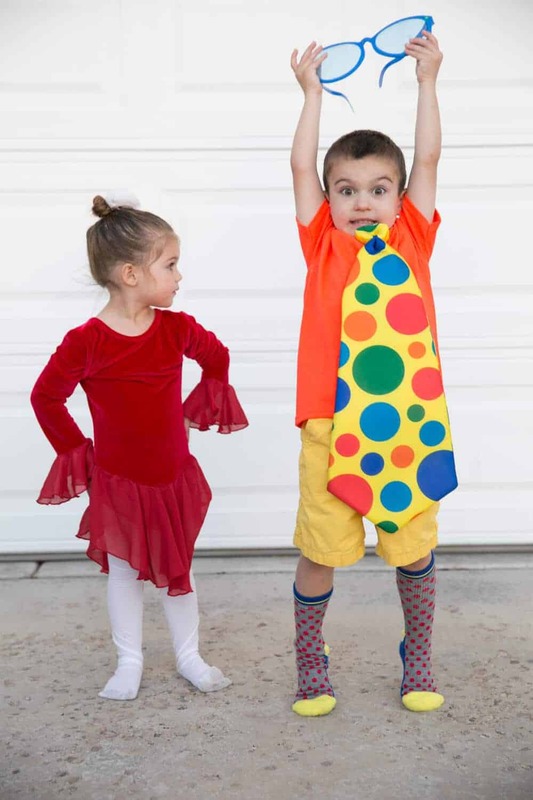 Check out these 6 super fun and simple Halloween costume ideas for your entire family! And learn Halloween costume tips for how we pulled off every costume for under $30 for our entire family! 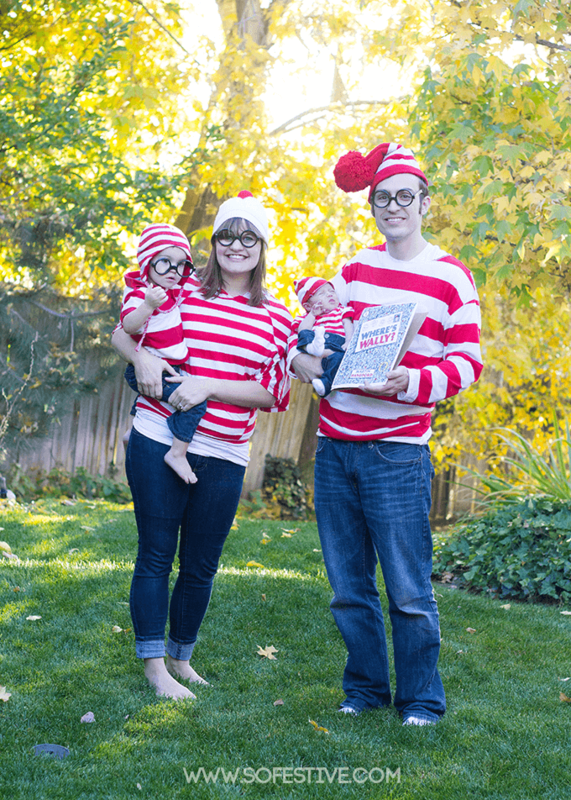 Family Halloween Costumes- Yay or Nay? Okay my friends, I’m getting a bit personal today. Usually I don’t like to talk about us since this blog is a place dedicated to you, but I wanted to share our family Halloween costumes from previous years. 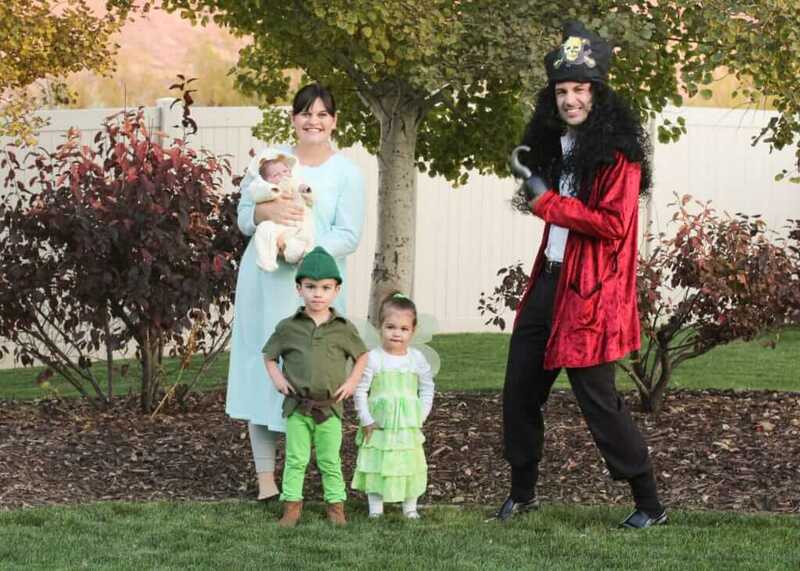 Ever since my first baby was born, we’ve done a family costume and it’s just too much fun to give up. I know when my children are older, they will want to do their own thing. So I’m relishing in this as long as I can. I LOVE doing family Halloween costumes, but I HATE spending lots of money on them. Especially when we are only going to get one or two nights use out of them trick-or-treating and wearing them for our annual extended family Halloween party. 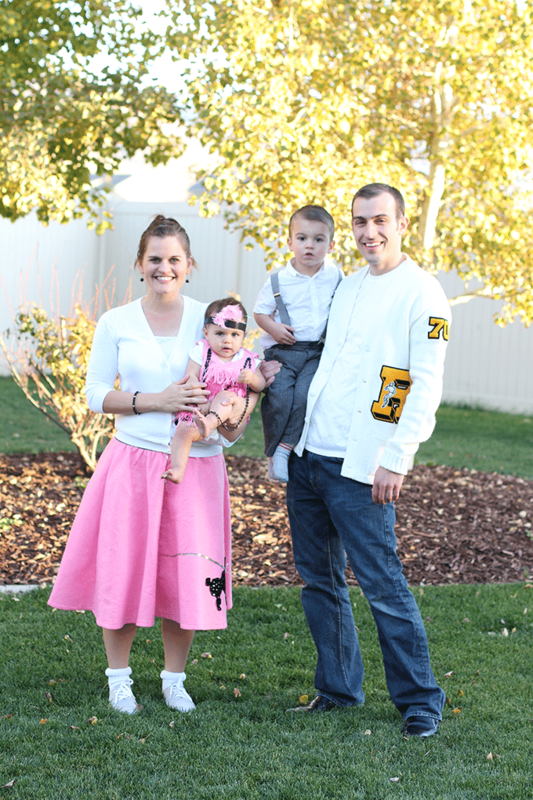 So here’s our Halloween costume ideas and how we’ve dressed our entire family for under $30!! Be sure to check out all my tips at the end of the post! The first year, there were just 3 of us, so of course we had to do 3 Amigos! I had a blast making our costumes. (Yes, I did have more time back then.) But, really, I only spent a few hours making all of our costumes. 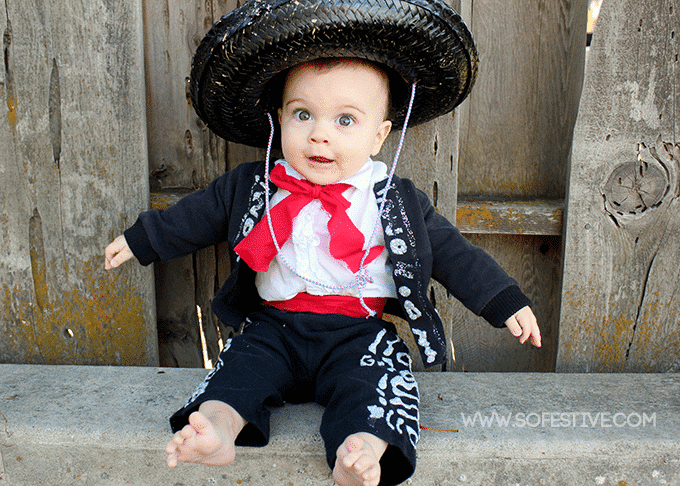 And seriously, it was all worth it for THE CUTEST AMIGO ever! Oh, how I wish I could go back and squeeze this little one again! 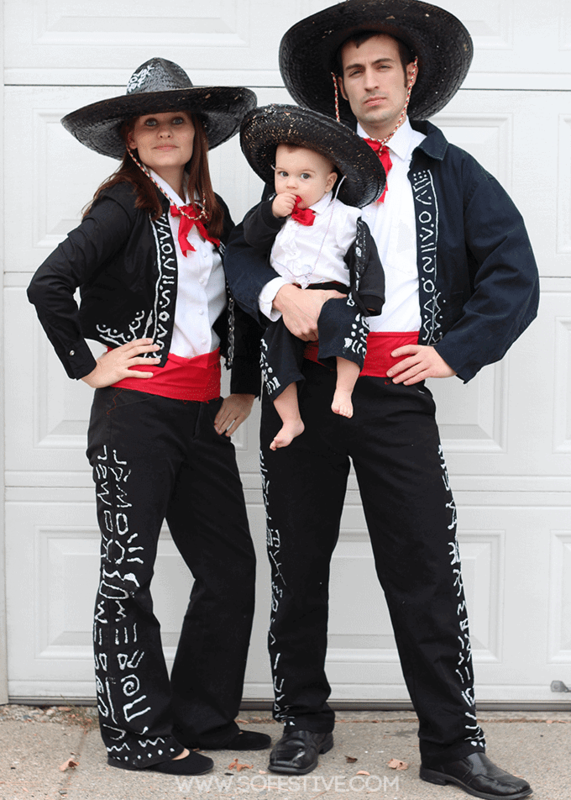 If you don’t have time or an awesome thrift store around, you can find 3 Amigos costumes on Amazon Prime here. The next Halloween, we had a 3-week old baby girl! We didn’t find out our baby’s gender until they were born, so I needed something generic that would work for a boy or girl. 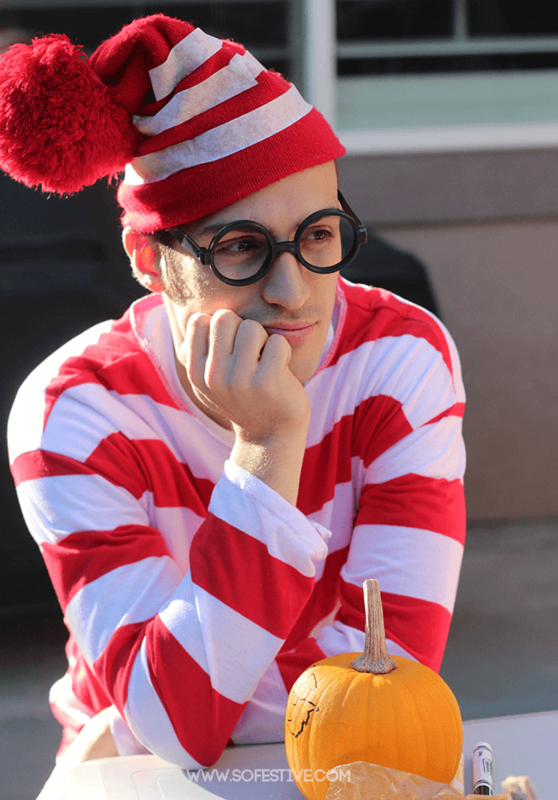 When I was browsing a thrift store, I found a red and white striped onesie and that’s what became the inspiration for our Where’s Waldo costumes! For our costumes this year, we were the double decade dates. I couldn’t resist since we had exactly 2 boys and 2 girls in our family. Another October baby (this time just a few days before Halloween) made deciding on a family Halloween costume idea tricky again since I didn’t know if I’d be pregnant or not. Enter the Wendy nightgown! Haha. Wearing that “beautiful” nightgown was the comfiest Halloween outfit I’ve ever worn. 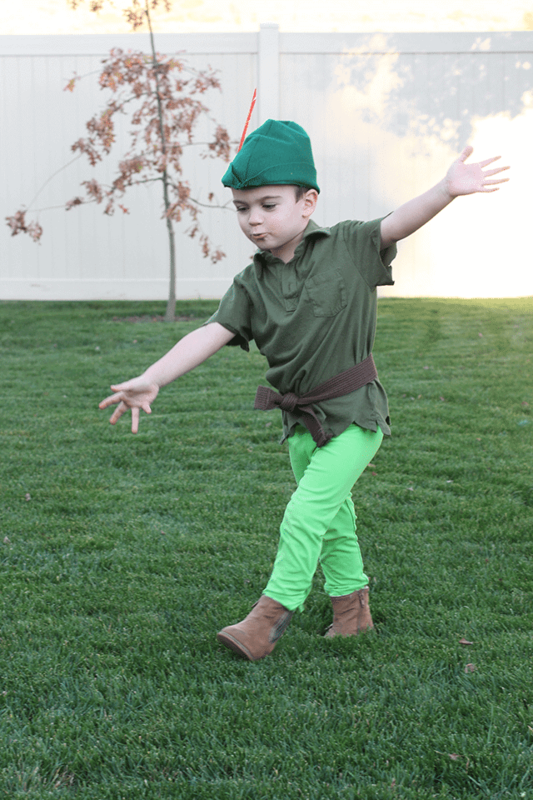 It worked perfectly for our Peter Pan family costume ensemble. And our baby got to wear a sleeper. Easy peasy! 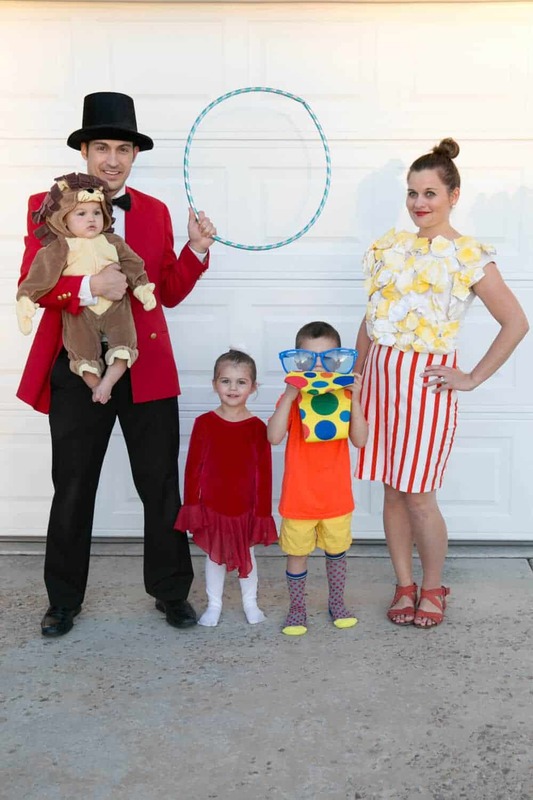 With 3 kids under 5, we are totally a CIRCUS, so we decided to dress up as a circus for Halloween. This was one of my favorite family Halloween costumes ever. 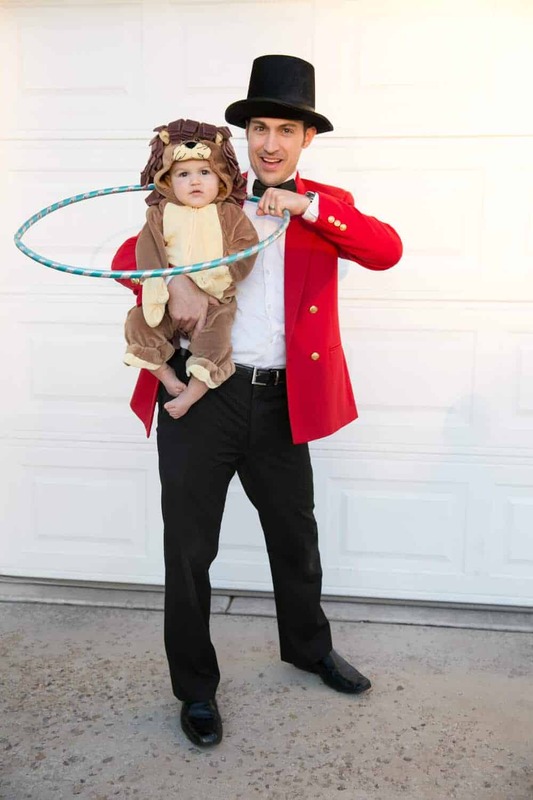 I found the lion costume at a thrift store for just a few dollars and in the same trip found my husband’s circus leader red jacket for a few dollars as well. It was actually a woman’s jacket, but no one never knew the difference. When you shop at the thrift store for Halloween costumes, you have to be a little creative, but you can usually find what you’re looking for. We had a hoola-hoop already and I ordered his black bow tie from Amazon. The circus leader black hat was brand new from Savers thrift store, but it was only $6. My four year-old wasn’t into wearing a lot of costume ideas, so the clown costume was perfect for him. I grabbed a bright t-shirt at Walmart for a few dollars along with the funky socks. and a clown tie that was on clearance at the Halloween store. The giant glasses were from Dollar Tree. My sweet girl was pleased as punch to wear this thrifted red leotard and tights. So a tight-rope walker she was! Within 20 minutes later, we had all of our family Halloween costume items found. 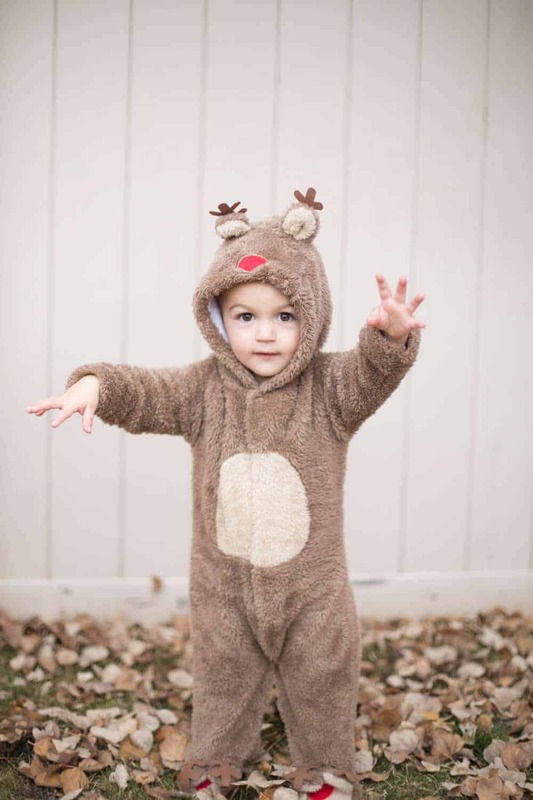 Of all our family Halloween costume ideas, our Christmas themed costumes were the simplest and quickest to find. 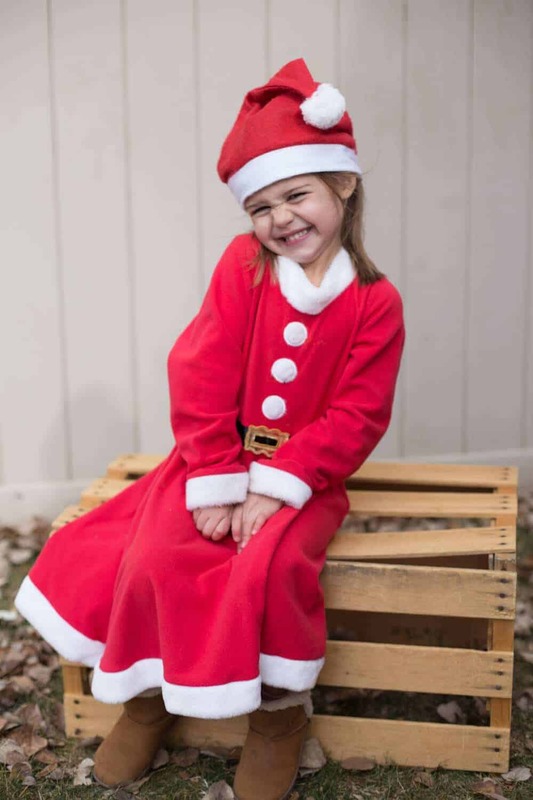 I found my daughter’s Christmas Santa dress on clearance at H&M back in the spring and had forgotten I had it. Pulling the adorable Mrs. Claus/Elf dress out a little early was totally worth it! 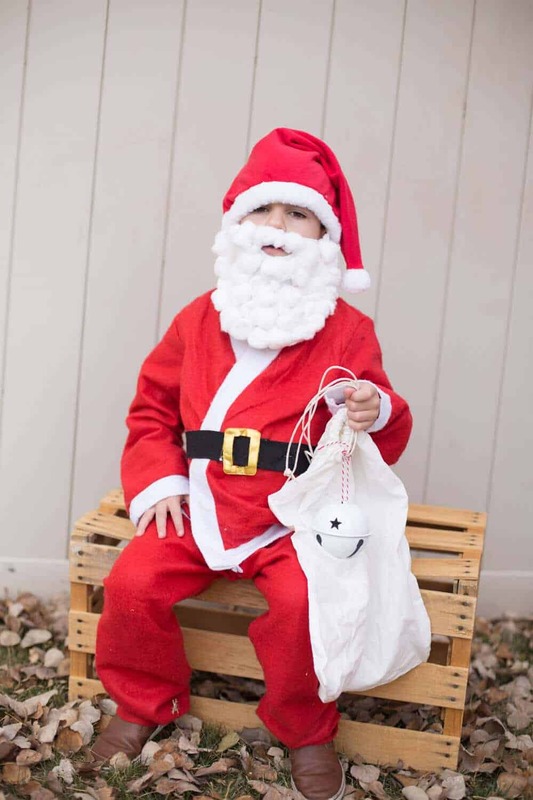 I wasn’t able to find any Santa costumes at the thrift store, but I did find this inexpensive Santa costume on Amazon for under $10. This Santa costume didn’t hold up more than a few wears, but for the price, it was totally fine. I made the beard out of a piece of felt and cotton balls and attached it to a Santa hat we already had with safety pins. 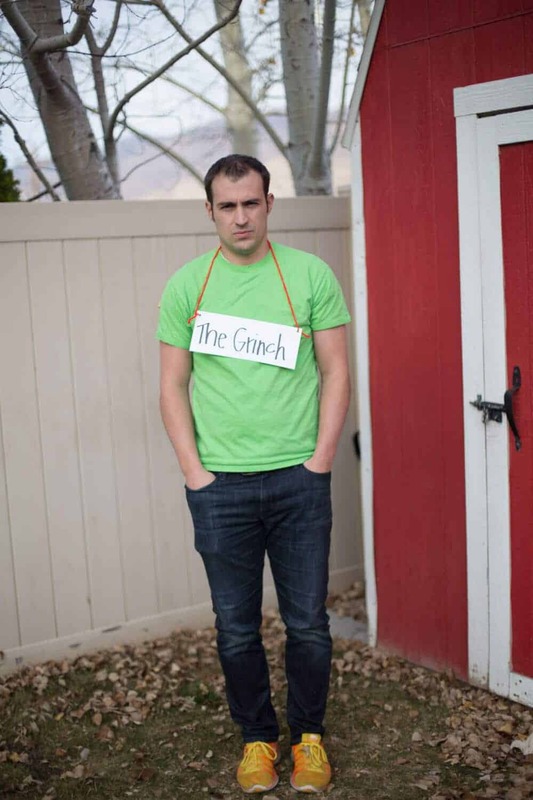 I have to laugh at this costume for my husband because my he HATES dressing up. 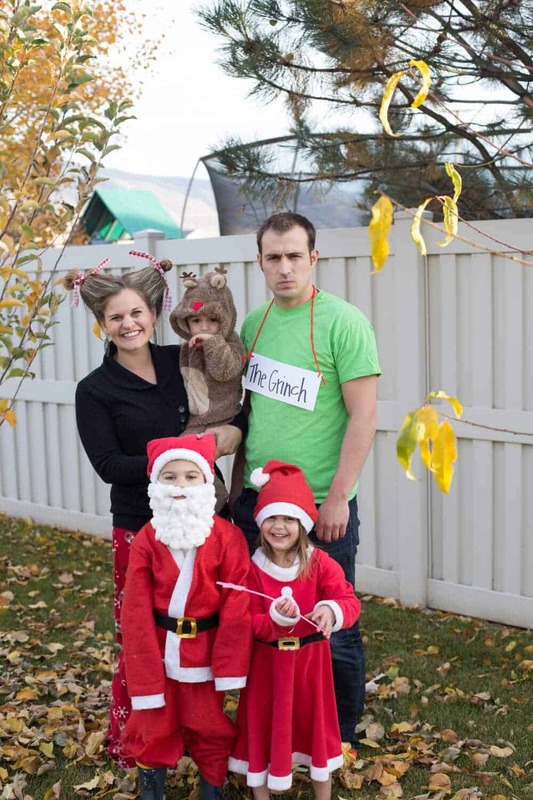 Poor guy for marrying a family Halloween costume-loving wife. Thankfully, he’s usually a good sport and will go along with it. But this year, he was delighted to play The Grinch with just a green t-shirt we owned. His costume fit him perfectly. Start at a thrift store. Browse a few aisles and see what you can find. It’s easier to get inspiration from what you can find than go to the store with a specific costume in mind and then not be able to find it. Look for basic costume pieces that can be repurposed as opposed to a completely done costume. Sometimes this won’t work, but most of our costumes aren’t really costumes, but pieces we have put together to create a costume. Search the entire store. You’ll find family Halloween costume ideas in lots of departments. Don’t be afraid to shop in both the men and women’s and children’s departments. For small accessories, use the dollar store. They are much cheaper than a costume store and sometimes even the thrift store. When in doubt, look on Amazon. Thanks to Prime, you can find pretty cheap costumes or accessories if you cannot find them at the thrift store. Start early. We usually start looking towards the end of September/early October so that there is plenty of time to find everyone what they need. With that said, we usually only go to one or two thrift stores and can find the rest at the dollar store, Walmart or Amazon. I hope this has been helpful as you search for your family Halloween costumes! Dressing up is so fun and you can pull it off cheaply with just minimal effort. Don’t forget the photo! You’ll love looking back at all of your Halloween costumes and see how your family has changed!